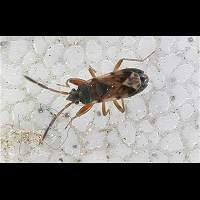 Scolopostethus puberulus can be told apart from other Scolopostethus species by studying the antennae. The two lower segments are ochrous or brownish. The two upper segments are dark brown or black. The border between the two segments runs exactly between the 2nd and the 3rd segment. In no other Scolopostethus species the contrast between the light and the dark part of the antennae is as defined as in this species. We found frustratingly little information about this animal. It is said to feed on Nettle. It is a European species, for eastwards it doesn't even make it to the Oeral. That's all we know about it at this moment.